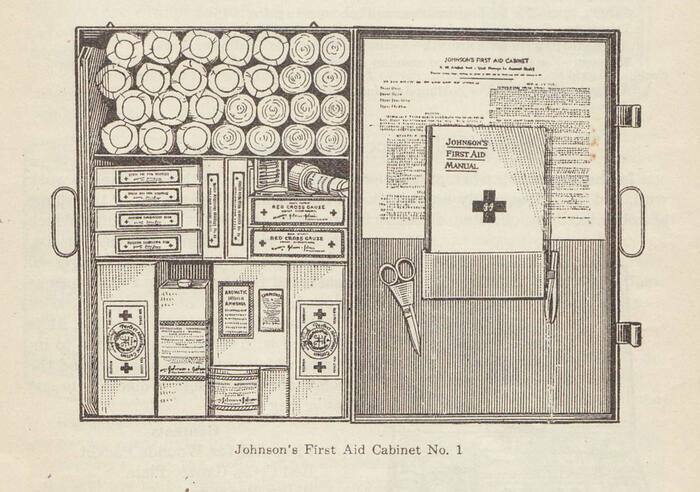 A fateful conversation inspired the creation of Johnson & Johnson’s First Aid Kit, which was released in 1888. Aboard a train heading to Colorado for vacation, company founder Robert Wood Johnson struck up a conversation with the Denver & Rio Grande Railway’s chief surgeon. The doctor explained to Johnson the dangers of railroad construction and the lack of medical supplies to treat the unique industrial injuries that were often incurred great distances from hospitals. From this exchange, Johnson saw an opportunity to both advance the field of healthcare and build his young business. And from this modern need, the commercial First Aid Kit was born. 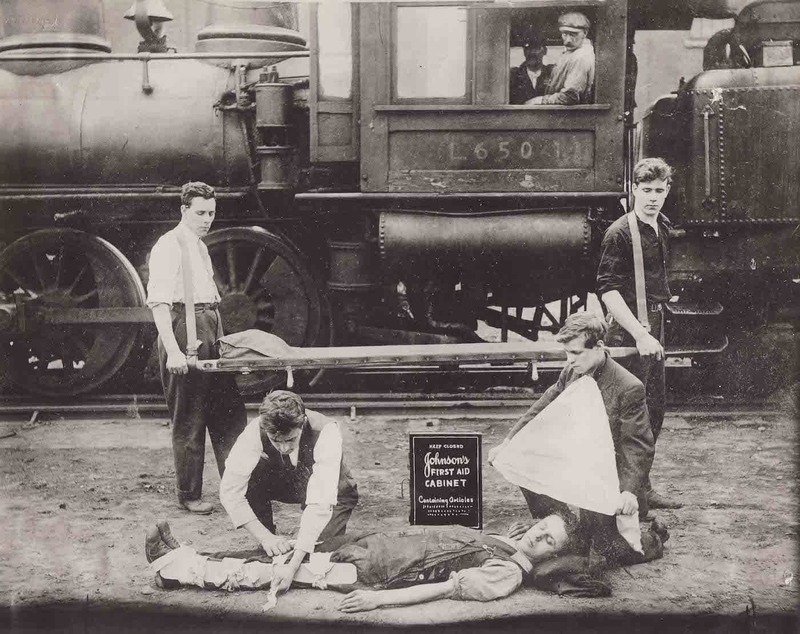 Railroad first aid demonstration, c. 1895. 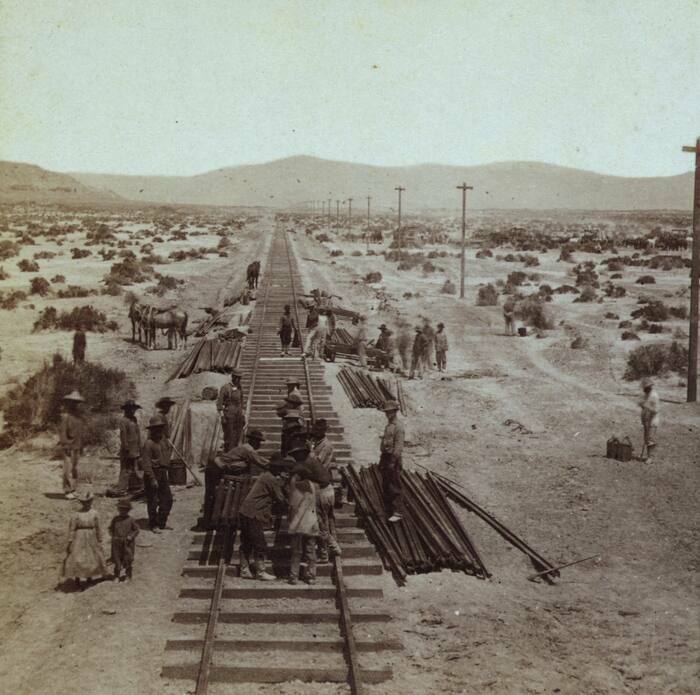 Railroad construction during the 19th century brought workers to isolated regions in the American West, away from hospitals and traditional medical care. The First Transcontinental Railroad was completed in 1869 and in the decades that followed, expansion continued at a fever pitch. Between 1880 and 1890, more than 70,000 miles of new tracks were laid. The frenzied construction in rural, rugged areas across the American West ensured accidents were common and, when disaster struck, it was often fatal. About 12,000 railroad workers and operators died each year. Not only was the cutting-edge machinery creating new injuries, but medical care on the frontier was virtually nonexistent. Additionally, working on steam locomotives was so dangerous that trains began carrying surgeons, and later, medical cars for treatment. In the 1880s, along the 1,300-mile stretch between St. Louis, Missouri, and El Paso, Texas, there was not one hospital. So it’s no surprise that wounded workers frequently perished before help arrived. Often the majority of railroad worker crews were immigrants hailing from China, Ireland, and Eastern Europe. To fill the desperate need for adequate emergency care, railroad companies began employing their own doctors. Since there was no textbook for the injuries they encountered, these physicians had to learn surgery on the job and improvise trauma care along the way. They creatively dealt with new injuries, among the most common was “crushed limbs.” These men were often champions of new technology—they were early champions of Joseph Lister’s sterile surgery. However, putting this theory into practice and keeping wounds germ-free proved challenging. Initially, few had operating rooms or antiseptic supplies. Even after the railway surgeons convinced companies to build hospitals and sterile environments in the West, death tolls remained high. 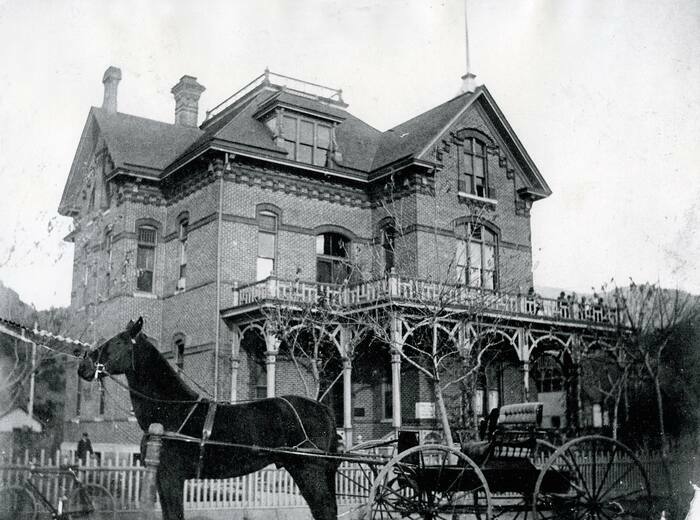 Among the first railroad company-built hospitals was the Denver & Rio Grande’s Hospital in Salida, Colorado, which opened in 1885.
attempts often did more harm than good—exacerbating spinal injuries or introducing infection. When Robert Wood Johnson heard about this problem, he had the idea of packaging Johnson & Johnson’s sterile surgical products in boxes that could be kept with railway workers to treat injuries. Johnson wrote to top railway surgeons asking for their advice about what they needed in the kits. He then called upon Johnson & Johnson’s scientific director, Fred Kilmer, to translate these needs into a product. Kilmer was a practiced pharmacist and scientist whose meticulous research on railroad medicine gave rise to Johnson & Johnson’s inaugural First Aid Kit in 1888. Kilmer was a visionary in the field who saw the kits as a way to bridge the gap between injury and treatment. He understood the need not only for sterile supplies but also for the education of the public to ensure that injuries were treated—not intensified—in the first minutes. Originally, Johnson & Johnson manufactured First Aid Kits tailored to the unique needs of individual railroad companies. 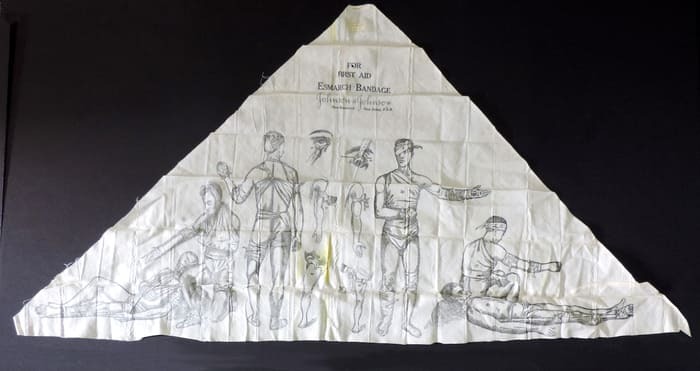 The first kits were packed in durable wooden or metal boxes and equipped with a variety of existing Johnson & Johnson surgical products, including gauze, adhesive plasters, dressing, bandages, and sutures. Because they were tailored to the unique needs of railroad construction, they also necessitated the addition of new supplies. Early Hand Book of First Aid. However, Kilmer knew that the kits, themselves, were not enough. They needed to include explanation and training. 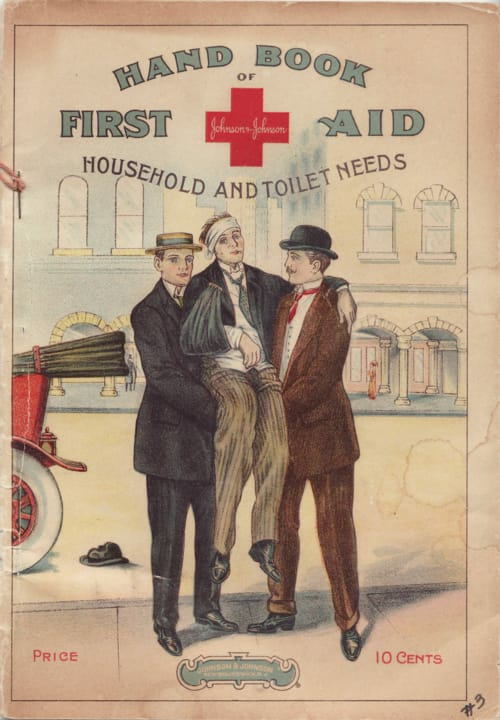 Since its founding, Johnson & Johnson had prided itself on educating the public and spreading antiseptic methods of wound care; first aid was another teaching opportunity. In 1901, Johnson & Johnson published the Hand Book of First Aid, the nation’s first comprehensive, commercially available guide to first aid. The guide reached beyond the railroad and medical industries, teaching Americans about basic hygiene and emergency care. Through illustrations and common emergency scenarios, it showed readers how to use Johnson & Johnson products to save lives. But, this manual did more than educate; it spurred a movement. In the years that followed, similar guides proliferated. As interest in emergency care took root, Johnson & Johnson’s First Aid Kits became increasingly popular. Though Johnson & Johnson didn’t invent the Esmarch bandage, the product was popularized in the company’s First Aid Kit. Directions were cleverly printed on the bandage itself so they could never be lost. Within a decade, first aid became the law—all American workplaces with more than three employees were required to have basic medical supplies starting in 1910. Throughout the 20th century, First Aid Kits were expanded to meet new needs. They were customized for homes, schools, travelers and the workplace. And as technology advanced, Johnson & Johnson was there: in cars and on planes. From the late 19th century through today, Johnson & Johnson’s First Aid Kits remain the standard in emergency care.